I truly hope it becomes the standard practice of Maine’s art-viewing public to attend the exhibitions at the art schools and colleges in Maine featuring the work of students about to graduate with degrees. These shows not only help us keep up with Maine’s schools and the progress of our students, but they also invite critical viewing. The onus, in other words, is clearly on the artist to deliver rather than the audience to keep up. While there are many excellent programs at colleges and universities around the state, the current standard for excellence is MECA’s Master of Fine Arts program. Unfortunately, the most disappointing of this year’s 11 offerings is the first thing you see: Allison A.’s shoe portraits. Usually, I would not even mention something so weak, but its placement in the front window is likely to make would-be viewers keep walking. It’s a retail-style installation set on a mound of saccharine lavender pedestals festooned with plastic jewels. Each of four portrait subjects is represented by her/his fanciful (or actual) shoes displayed on mannequin legs. The major problem is that the ostensibly ironic kitschy gestures clash horribly with the artist’s genuine but mawkish respect for the subjects (including her teachers). The other front-space work is something now rare: extremely strong large-scale abstract paintings by a student. Angela Warren’s two 6-foot-square canvases aptly claim a connection to music by their titles, and the connection works. They are smoothly rhythmic and tonally consistent, and they achieve a dynamic sense of harmony. While they range nicely, each ultimately and fully resolves to a tonic color key. Warren’s canvases are good enough to make the case that she didn’t just get lucky with these two canvases but is already a strong and mature painter. She clearly has the sensibilities and the chops to make it anywhere. The most impressive, ambitious and unusual work in the show is Rachel Herrick’s “Museum for Obeast Conservation Studies.” It’s a one-room taxidermy-style installation not unlike the “Back to Nature” vignettes that have charmed generations at the Maine State Museum in Augusta. 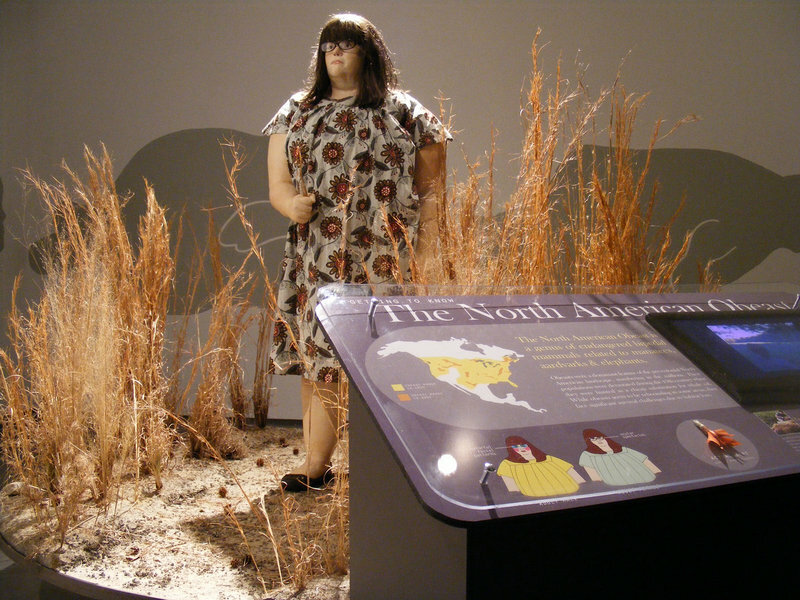 Because the Obeast is an obese young woman, I was mortified when I first saw the installation, because I could have been looking at one the most offensive works of art I had ever seen. I hadn’t seen the name and did not know that the artist was a woman. I can’t remember the last time my moral sensibilities had been so thoroughly challenged. Allergic to self-pity, Herrick subtly relates that obese Americans have to deal with people who routinely confuse physical largess with diminished mental capacities. Part of the joke is that Herrick plays no heavy-handed card, and leaves bigots to twist in the wind of ignorance — never the wiser despite her razor-sharp educational and informational professionalism. My favorite Maine video piece of the past year is Molly McIntyre’s “Christmas Present,” a 7-minute, stop-motion animation with narration by the artist about spending a Christmas with her boyfriend’s family. The wall-projected image is small and intimate, the Sonotube and felt “stump” stools are awesome, and McIntyre’s narration is masterfully set to an original but appropriately low-key soundtrack. Like Herrick’s, McIntyre’s self-deprecation is brilliantly deft. 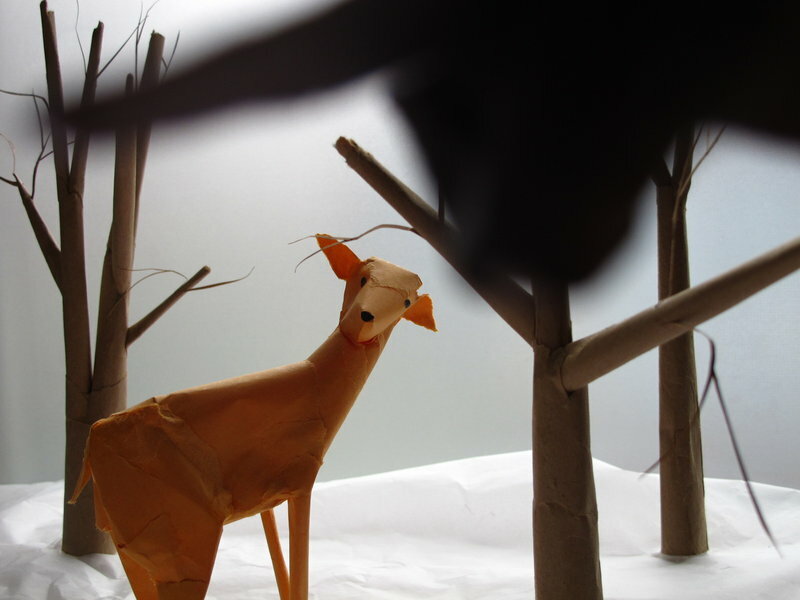 Over the video’s Rudolph-like paper deer in a paper forest, McIntyre speaks. Her voice is that of a tiny, even squeaky, adolescent girl, but her identity is a normal young woman whose honest and genuine speech betrays a sort of abrupt but sweet emotional immaturity. McIntyre’s deceptively savvy narrative is captivating and charming. Another favorite is Sarah Bouchard’s “White Cube,” a brilliant meditation on structuralism and the creation of architectonic spaces using modular repetition pretending to be minimalist sculpture. I also liked Sarah Obuchowski’s hand-felted and handmade yurt, inside which is a mini-tundra complete with a sculptural rabbit and fox-hunting narrative. And I hope people won’t accidentally miss the MP3-narrated walk around Portland created by Tamara Reynolds. It’s a terrific piece that doesn’t skimp on production quality or experiential detail. However unusual or challenging the 2011 MECA MFA show, your experience or opinion as a viewer cannot be denied. If it doesn’t sound like your typical idea of fun with art, this is a great chance to expand your horizons. Bring the family, an open mind and enjoy yourself — this is really good.